and twisted into one finished yarn. 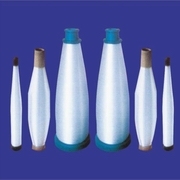 It is widely used in production of fabrics as finished well as electrical wrapping material. Theindividual requirement of any fabric shall be satisfied by adjusting filament diameter, tex No. Yarn twist and No. of plied yarn as well. It is widely used for home appliances,communication apparatus.